After watching one scrimmage game at the beginning of the Amity football season, I predicted that they would have a great season. And, well, I was right. 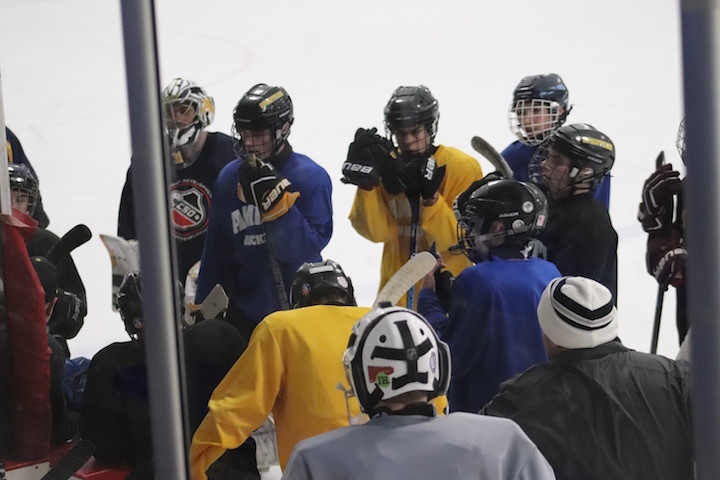 Friday night I sat in on the Amity Boys Hockey team’s practice session in West Haven to see if I could make some sort of prediction about their future this season. Nobody was in uniform, so I haven’t a clue who anyone is yet, but I am pleased to say that the 23 boys on the 2018-19 team show a load of potential and I am very optimistic about this season. It looks like we’ve got some real talent in the pool of three goalies and as far as the rest of the team – they’re fast with some sharp moves I do believe we will have three or four stand-out players as we have in the past few years. Head Coach Michael “Scooter” Richetelli brought the Spartans all the way to the state championship game in 2014, after a stellar season. That team, which included notable members, Goalie Brian Mosher, Kevin Ryan, Adam Shea, and Brett McNeil, played their hearts out against Daniel Hand, which ended in a loss after Hand broke a 4-4 tie. Out on the ice, Richetelli commands the boys’ attention and has a strong, yet kind approach to getting them to execute the plays he lays out. The assistant coaching staff has a new face this year, as longtime coach Brian Gonsalves has moved on to Daniel Hand. His replacement, John (I think) is older and has a long ice hockey history. He played at Fairfield Prep, then more recently coached at Masuk. I’m excited about this year’s boys’ team and I can’t wait to see them in action at next Wednesday’s HOME scrimmage game. There’s a lot happening with this team in December. Today, the boys are in Westfield, Mass for a scrimmage game, then, on Wednesday, the 5th, they are HOME in West Haven for a scrimmage against Masuk at 7 p.m. followed by the West Haven Jamboree at 6 p.m. on Friday. 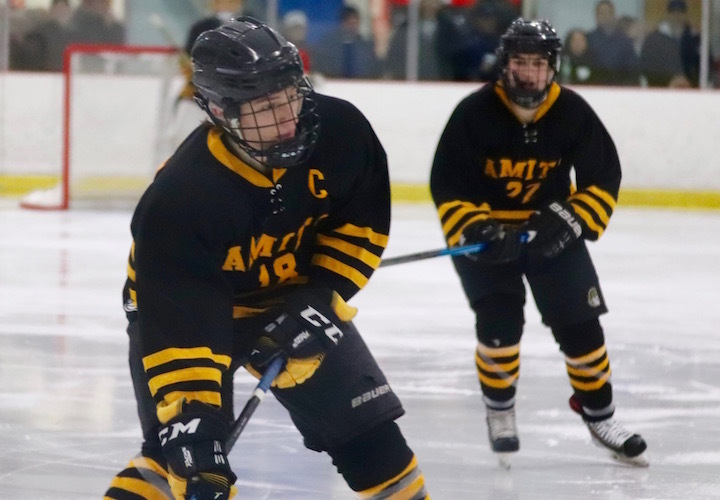 Amity is AWAY for the first three games of the season: Wed., Dec. 12, Danbury Ice Arena vs NFI at 5:30 p.m.; Sat., Dec. 15, Milford Ice Pavillion vs Milford Coop at 1 p.m.; and Wed., Dec. 19, vs BBD at 7:40 p.m. They get a holiday break, then return on Sat., Dec. 29, for a HOME game vs Staples at 1 p.m.
With the regular season drawing to a close, it is imperative that the boys’ hockey team and every team performs their best on the road to the SCC Championship games and then, hopefully to the state competitions. From the very first scrimmage, Orange Live expressed its belief in the Amity Spartans Hockey Team and after an “okay” season they are finding their stride — and just in time. With their Valentine’s Day win over North Branford, the Spartans qualified for the upcoming tournament. On Saturday, Feb. 17, the Spartans (9-6) were on the road in Danbury for a matchup against Newtown (7-10) and they continued to show their excellent skill on the ice. As you can see, the game was 100 percent Amity. Colin Hughes slapped one in unassisted, at 1:25 and put Amity on the scoreboard. The second period was huge for the Spartans just 4:34 after returning to the ice, Jordan Conn made a goal, assisted by Michael Miller. Just three minutes later, Nelson Bordeleau scored on an assist from Adam Moscato. After that, the scoring was fast and furious. Joey Schittina made an unassisted goal within 35 seconds of the last one, and 50 seconds later Brian Early made an unassisted goal of his own and two minutes later it was Conn’s turn again, assisted by Early. Conn made his third (hat trick) goal on an assist from Jamie Blum. Then two minutes later Michael Decesare scored on assists from Justin Miller and Jake Silliman. On Tuesday, Dec. 12, I attended a scrimmage game between the Amity Spartans and the Masuk Panthers Varsity ice Hockey Teams. Of course, the scrimmages don’t count for the season, but from what I saw out on the ice in what resulted in a 6-3 “victory” for the Spartans, this year’s team, with its 11 seniors, promises to give fans something to cheer about. 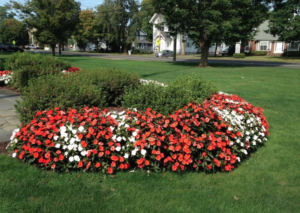 Out and about at many Amity events, it’s clear that students adore former Hockey coach Gary Lindgren, and I don’t think that will ever change – he’s a lovable guy. But back in 2013-14 when Gary was battling cancer, his assistant coach Mike “Scooter” Richetelli stepped in and brought the boys all the way to the state championship game. Richetelli, now the Head Coach, and most of the coaching staff are back, and the team is amazingly fast, aggressive and tight. Unfortunately, the current roster hasn’t yet been posted to the CIAC website, and Amity’s new revamped site is still a mess (just my opinion). 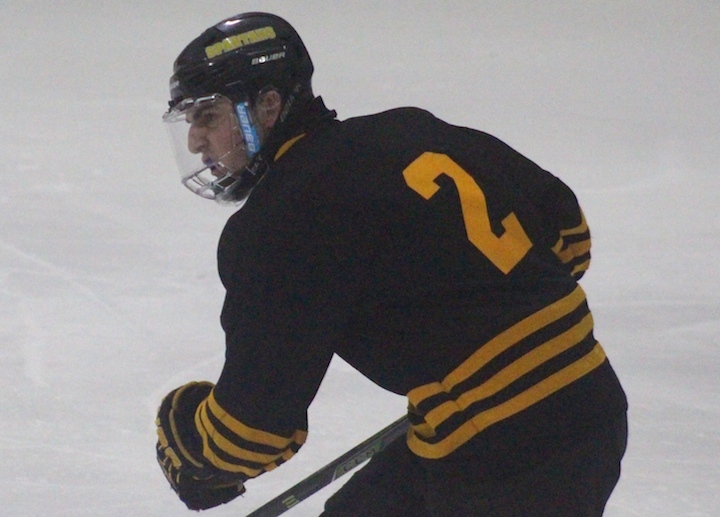 The Spartans play again tonight in the Jamboree at Bennett Rink (West Haven High School), taking the ice for 20 minutes against West Haven around 6:40 p.m. and again at 8 p.m. against Immaculate. Richetelli said the team had a good scrimmage in Westfield, MA that gave them an early start and they did well on Tuesday. “We have 11 seniors and with their leadership, they’ll do what they’re supposed to do.” — (I wonder if any of those seniors were part of the excitement in 2014). For the team’s first official game of the season, they’ll host BBD (Brookfield/Danbury and ?) at the Edward Bennett Rink in West Haven. this Saturday, Dec.16 at 6 p.m. I encourage everyone to come out to cheer on the Spartans. Who knows, this could be another championship season in the making. NOTE: Don’t forget the Girls’ Ice Hockey team, which always plays incredibly well, has three games this week. Friday, Dec. 15 vs New Canaan Home at Rinks at Shelton 8:30 p.m.
Saturday, Dec. 16 vs Lauralton Hall Home at Rinks at Shelton at 4:30 p.m.
Sunday, Dec. 17 vs Masuk-Joel Barlow-Newtown-Oxford (Away) at Rinks at Shelton at 6:30 p.m.